I seem to be on eternal quest to get that perfect glowing skin – the kind that looks like you’ve made no effort and just woke up with a naturally radiant complexion. Not one to give up on a beauty mission easily, I’ve got a five-step routine in place to give my skin some serious glow. A good glowing base starts with a good skincare routine – the best way to look naturally flawless is to enhance your natural skin. For me, my skin looks the most radiant when it has had regular exfoliation – for an easy fix, I love the Clinique fresh pressed renewing powder cleanser which is packaged like a little sugar-sachet. Adding a splash of water to the powder transforms it into a gentle skin polish, which is perfect for waking skin up in the morning. For good glow, a serum is the way to go – I am loving the new Caudalie Vine[Activ] serum which adds just the right amount of hydration for the skin. I change my moisturiser depending on how my skin feels, but the embryolisse lait-crème concentré makes a gorgeous satin base for any foundation (and also works brilliantly mixed in with a heavy foundation). It’s one of those cult French products that everyone needs to have in their stash. I’ve waxed lyrical about the benefits of an illuminating primer, but it’s really such a good step for adding radiance to the face for when you want to take your glow to the next level. A good primer adds hydration to the skin, smoothes everything out for subsequent foundation and bathes skin in light. I like the Laura Mercier radiance, the Becca ones, MAC, Dior… I like a lot! For dewy skin, it makes sense to ignore the bases that promise a matte or satin finish and head straight to the products that deliver luminosity to the skin. 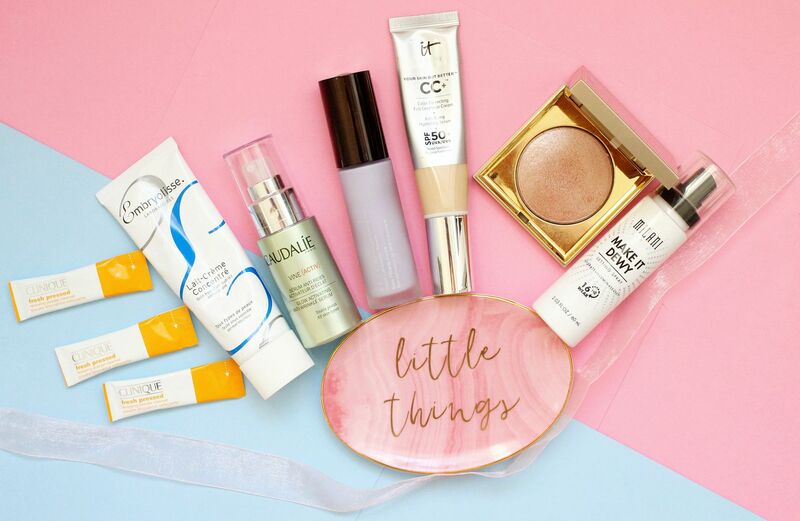 I adore the It Cosmetics CC cream for making skin look simultaneously natural and flawless, but my top tip would be to mix a drop of oil or serum into any base to give it a little bit more slip and sheen. I mean, yeah. Highlight is basically a non-negotiable. Dusting a little (or a lot) over the top of the cheeks, under the brow bone and pretty much everywhere is one of my favourite makeup steps and I just love to see the glow! My favourites are from Stila, Becca, MAC and Urban Decay. I can’t even remember the last time I did my makeup and didn’t use a setting spray – I told you I was high maintenance. I just think a setting spray finished off the makeup nicely and makes sure all your hard work is locked in – my absolute favourite is the Milani make it dewy setting spray. It adds even more dew to the skin so your skin looks seriously glowy and it helps prolong makeup. I also like Fix + for using throughout the day to keep makeup looking fresh.